Seize the prized moments of your life using the GoPro Black Surf video camera. With user-selectable field-of-views ranging from ultra-wide to narrow, this GoPro HERO3 camcorder delivers more perspective capture options to compose the perfect shot. Moreover, the six element aspherical lens with an aperture of f/2.8 included in this waterproof camcorder helps capture distant subjects in great detail. 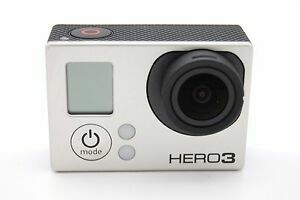 In the photo mode, this GoPro HERO3 camcorder clicks crisp images with a maximum resolution of 12 MP at the rate of 30 photos per second. You can plug in a microphone into the optional 3.5 mm stereo adapter that this waterproof camcorder bears and capture sounds with utmost clarity. As the GoPro Black Surf video camera supports storage cards up to 64 GB, you can store photos and videos to your heart’s content. Thanks to its built-in Wi-Fi connectivity, this GoPro HERO3 camcorder can be synced with iOS tablets and smartphones for seamless sharing and live scene preview of images and videos. 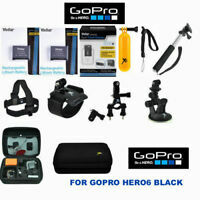 The GoPro 3 is a great older product, at a great price. Works well with my Gimbal Handle and produces excellent quality video! 110% meets my needs! Pros,it's small and lightweight.Cons:battery dies quickly on remote control.USB cable that came with camera stopped working,photos won't upload to computer.Remote came without key,just the charger came so I had to order one.Photos are less than average quality even with trying different settings,If I could get my money back,I would. This is a good HD camera. Might as well buy the hero 4 though because this doesn't have an LCD screen to view the frame, you can purchase one separately though. Thanks! The camera functions as its supposed to however the battery doesn't last but about fifteen minutes. The USB connection pushed in and broke the fourth time I used it and no I didn't put it in upside down. Works as intended. Shows signs of having the case re-glued repair. Several scratches but does not affect the operation of the camera.